CANImmunize for iOS has been updated to version 3.0 today, which introduces CANImmunize Accounts, to let users save their records securely across all devices and in the cloud. 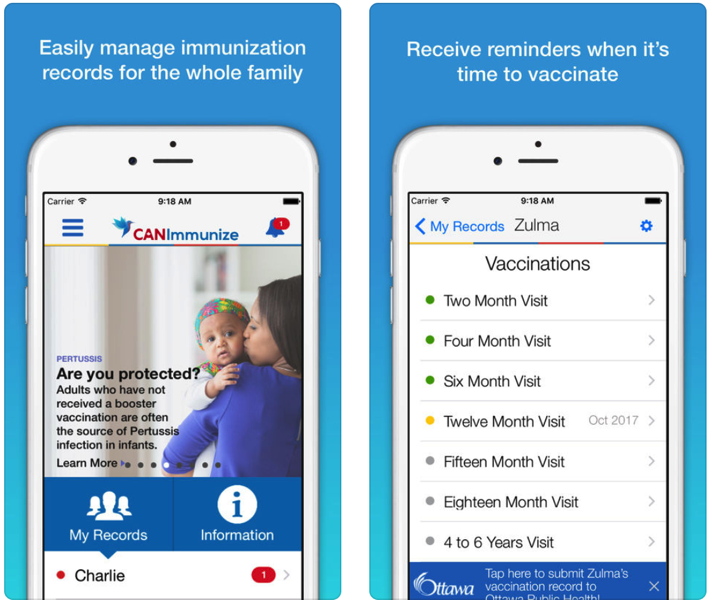 For those who have never used CANImmunize, it allows families to track their childhood and adult vaccinations, plus also provides reminders on upcoming vaccinations on your iOS device. The app also provides data on vaccination schedules by province or territory and also has other info to protect yourself from outbreaks and vaccine-preventable diseases in your area. For residents in Ottawa, they can use the CANImmunize app to report their children’s vaccination records to Ottawa Public Health. The app first launched in 2014 and was called ImmunizeCA at the time, a collaboration between The Canadian Public Health Association (CPHA), Immunize Canada and the Ottawa Hospital Research Institute. Click here to download CANImmunize for iOS, as it’s an easy way to track vaccinations for your newborn and family.